Longtime IUPAC member Itaru Mita, professor emeritus of polymer chemistry at the University of Tokyo (UT), Japan, died on 1 November 2009 at the age of 80. Mita was a prominent chemist whose scientific pursuits focused on kinetics and the mechanism of polymer reactions, including living anionic polymerization, degradation and stability of thermostable polymers, molar-mass effects on rate coefficients of elementary reactions in polymerization, intra- and inter-macromolecular reactions, and reactions in polymer solids. 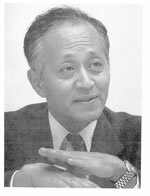 Mita served many years in the Society of Polymer Science, Japan; chairing several committees, one after another, and then serving as president in 1990–1992. He played important roles in organizing IUPAC International Symposia on Macromolecules in Tokyo (MACRO ’68) and Kyoto (MACRO ’88). Mita started his IUPAC activities in 1977 as a member of the Commission on Macromolecular Nomenclature. He was an associate member from 1977–1979 and 1989–1991 and a titular member from 1979–1989. He contributed in preparing “Source-Based Nomenclature for Copolymers” and other IUPAC recommendations compiled in the first edition of the Purple Book (1991). The Institute of Science and Technology at UT, of which Mita was a member since 1956 experienced four complete reorganizations during 32 years. He spent some tough years as the head of the department when it was the Institute of Interdisciplinary Research. This was during the period of “scrap and build” in national universities after the Second World. It is worth noting that Itaru’s wonderful personality created a positive environment for bright young students, 12 of whom later married and will undoubtedly forward his spirit to the coming generations. After his retirement from UT in 1990, Mita worked as a president in the Dow-Corning Asia Research Center, Ltd. for five years and continued to be involved in SPSJ and IUPAC. His most recent contribution was the proposal of “Generic Source-Based Nomenclature for Polymers,” which is compiled in the second edition of the Purple Book (2009). He also served until March 2009 as the chairman of the Plastic Terminology Commission in Japan for the International Organization for Standardization. Mita is survived by his wife, Hisako, a son and a daughter, and four grandchildren. We have lost a great scientist, a sympathetic and respected partner in discussions, a good friend, and an ambassador for science and culture for his country. Kaz Horie, professor emeritus of the University of Tokyo, is a member of the IUPAC Polymer Division Subcommittee of Polymer Terminology.